This photo was taken at the Gemsbokvlakte waterhole in the Etosha National Park in Namibia this past November. We had waited for a long time for this male lion to get up and when he did, he proceeded straight to the waterhole. A lone giraffe was also in the area, and also thirsty. 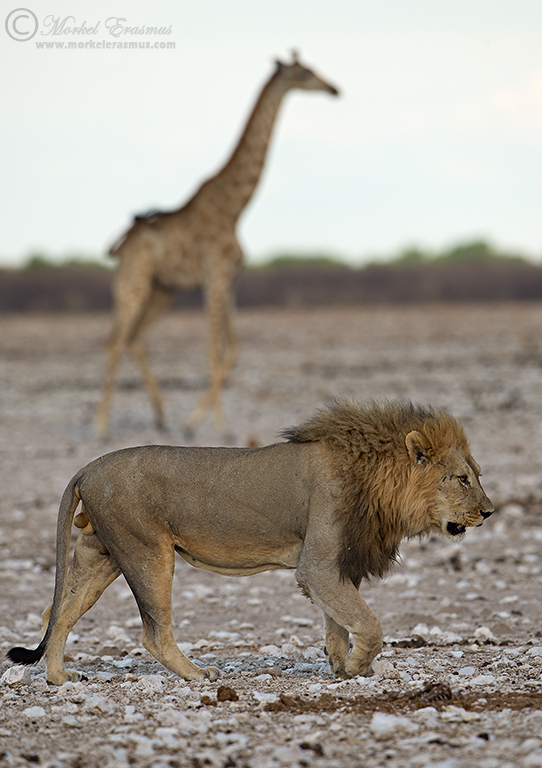 In this frame it looks like they are heading in the same direction (and the title implies thus), but the giraffe was actually mostly keeping a close eye on the lion. And no - this is not from the sighting where I witnessed a pride of lions taking down a giraffe on the same trip...more about that later! Just goes to show, there's always an opportunity to learn from your mistakes in the field, and you're never too old to make mistakes and realise them way too late, haha!